What fuel injection problems are common with a '70 Flavia coupe? Is it normal for the fuel pump to whine while the engine is running? If not, what is the problem? Are fuel pump / fuel injection parts easy to source and expensive? Which is better a fuel injection or a carb Flavia coupe? If this sharp braking is not normal, could there be a problem with the brake booster? Brake booster rebuild cost (approximate) + where can I get it rebuilt? Never driven a Flavia coupe before and found the accelleration on this fuel injected Flavia coupe is a bit sluggish, unlike a Fulvia coupe. However, once you go up through the gears, it's fast! Any advice and contacts most welcomed & appreciated. That might not be the cause...given there are steering problems perhaps there is a suspension/steering joint or two that need changing and the calipers are sticky from lack of use? If it was me I'd want a specialist to get it up on a ramp with a pry bar to see what moved. Perhaps even a regular MOT tester would pick up a problem that bad. On a Fulvia thread I think Chris Gawn was swapping joints as there was a problem driving that didn't show up on a ramp or even looking at the joint off the car. If looking to buy this car it sounds like a front suspension and steering rebuild should be in the budget. For 1970 it was the mechanical system not a "2000" with Bosch? There are specialists who can help, but of course the hours and parts can mount up. Tim Heath has been down that road recently. I think its possible to fit an injected car with carbs, but the block is special to the mechanical injection cars as it has the drive. These days, depending on how original you want to keep it, there are after market injection systems in the same way as people swap to programmable ignition. Which is "better"? Depends what "better" means to you... For a classic car a simple single carb has a lot going for it and is likely to be "better" until the top end of the rev range. Depends if you want it to pull well and be easy to setup and look after or want an extra 10mph on the top speed down the autostrada. Thank you David for taking the time and of course, your valuable, helpful advice & links. The car certainly looks good and I'm tempted but I think I will look around for a carburettor model. However, I think it prudent to drive a few other ones. The easiest way to check steering joint wear on the road is to accelerate then decelerate using only the engine braking. If the car deviates from straight ahead doing either then you have worn steering joints. Easy to replace on a Fulvia with a cost of a full set of joints/arms of around £200 from Cavalitto. I am not sure whether a Flavia has a steering idler like Fulvias but wear in this is easily checked when the steering arms are disconnected and of course steering box wear can also be easily checked then. I ( and much better mechanics than me!) have always found it difficult to check steering joint wear when the steering is connected. Trying some other ones seems like a good idea. Generally Flavias have an excellent reputation for their handling, obviously not as chuckable as a Fulvia but a good one should still be a delight to drive. An injected model is desirable, and once they are right the reputation is that they remain so. More than anything its the condition of the shell. Mechanical bits, new and second hand, are little issue. "Large lumps" like a gearbox or engine are almost at the "come and get it its yours" level. Its an enthusiast following not investors and its more fitting than fettling. In terms of acceleration perhaps do a top gear acceleration run against the watch and compare with road tests? It might be an engine issue, it might "be that its so refined you barely notice how the speed gathers" or some such road test speak for "sluggish" (relatively, its ALWAYS going to be a relative thing). Its a GT not a rally car, for all they did ok in rallies you need to look at what other stuff they were up against at that point. Did well as touring cars at Spa etc, "high speed stability" stuff. They have a steering idler, and there's a lever on the top to restrict the lock when snow chains are fitted. I can vouch having had both 1800 carb and KF inj Flavia Vignales that a sorted KF is a very nice car to drive with both accelleration cruising and top speed. The clutch can be a bit sensitive if not set up correctly or gearbox input oil seal is leaking. Kf parts are hard to fing in working order. Thank you all for taking the time to reply with your advice & Flavia experience. Yes it's indeed a different driving experience than the Fulvia coupe. One small design flaw is that I think the large, standard looking rear lights detract from the look of the car. Smaller, and inset vertically into each wing would be my preference + chrome bumper overriders. Like it's 'big cousin' the Ferrari 250 GTE? 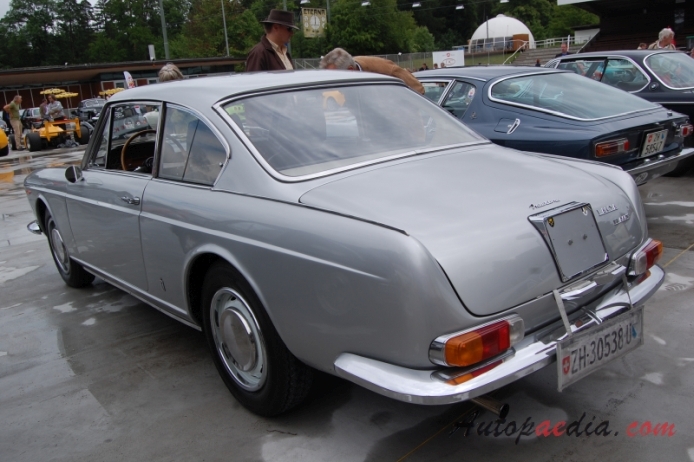 A better resolved design then the '60s Flavia coupe? Probably (sorry Lancisti). The Ferrari is a beautiful car in its own right. It's a shame so many have been chopped for replicas. A Flavia appeared in 'Trust' last week. 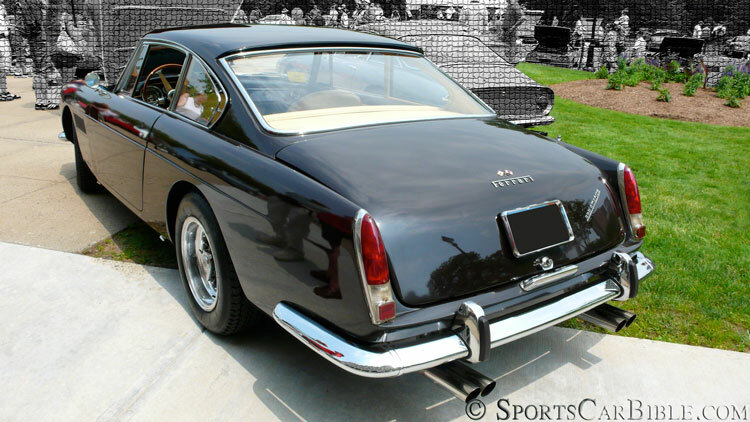 Now why didn't Lancia design the same elegant, rear Ferrari lights and chrome bumper overriders? The Ferrari is indeed an elegant but thitsty & expensive car. An HF without fuel injection by the looks of the engine bay!